time, the mid-priced Digital R50 has some big shoes to fill! niversal Remote Control Inc. (URC) has a tendency to produce remote controls that are, if anything, just a little too addictive. An early example of this was the Home Theater Master SL-9000 (read our review), an eminently simple remote with an uncommon level of versatility that quickly became the “go-to” solution for custom installers on a budget. By the time that newer and better designs were released, some installers had become so deeply entrenched with the SL-9000 that URC had great difficulty convincing them to move on to the latest models. One of those new models, the Home Theater Master MX-500 (read our review), took the powerful flexibility of the SL-9000 and made it bigger and friendlier with a customizable LCD display and more modern design. The MX-500 was perfectly positioned to topple prior “power remotes” from their thrones, thanks not only to aggressive pricing but also four key attributes. First, it could effortlessly control a large number of devices. Second, it featured copious buttons that could hold any command desired by the user. Third, it offered a level of customizability far above the norm. And fourth, the ergonomic layout just worked for a wide range of users. With so much on its side, it was no surprise that the MX-500 quickly became the remote control of choice for custom installers on a budget. But the MX-500 went further and succeeded in a market that the SL-9000 never quite managed to breach: do-it-yourselfers. Capitalizing on such a successful design, URC has re-released the same basic model with new features several times since, adding RF in the MX-600 and MX-650, computer programmability in the MX-700 and MX-800, and updated materials in the most recent MX-850. All of these models are intended for the professional custom installation market, but the company’s URC and RF lines (read our review) share similar looks and design ideals and are aimed squarely at consumers. I guess you really can’t have too much of a good thing! It has now been over 8 years since we first held the MX-500, and despite numerous generations of remotes that have come and gone the MX-500 remains an actively sold product. But as technology marches ever forward, so do consumer expectations. 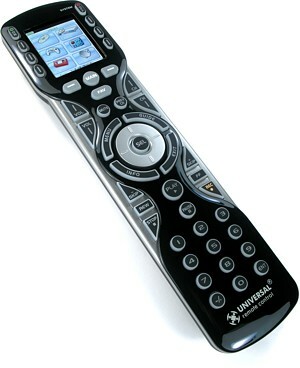 Today an advanced universal remote is expected to have more than the MX-500 is able to offer. There should be a bright color screen with pleasing graphics, programming should be quick and intuitive, and the selection of hard buttons should meet the needs of modern devices such as DVRs and media players. Universal Remote Control Inc. has answered the call for a newer, more sophisticated remote in the under $200 price range with the Digital R50. As the most technically advanced remote the company has thus far marketed direct to consumers, the R50 comes equipped with a full color LCD screen, can control nearly twice as many components as the MX-500, supports infinitely more macros and, just like the MX-500, can be fully programmed without the use of a computer. With its price set at $149.99 USD MSRP, the R50 is also less expensive than the MX-500 was when originally released at $179.99. More for less? What’s not to like!